Skiing in Mt. Washington Valley, Winter Fun! Bretton Woods Offers Free Junior Winter Mountain Season Pass!! BRETTON WOODS OFFERS FREE JUNIOR WINTER MOUNTAIN SEASON PASS! With lease or purchase of a Junior Equipment Package from select retail partners. 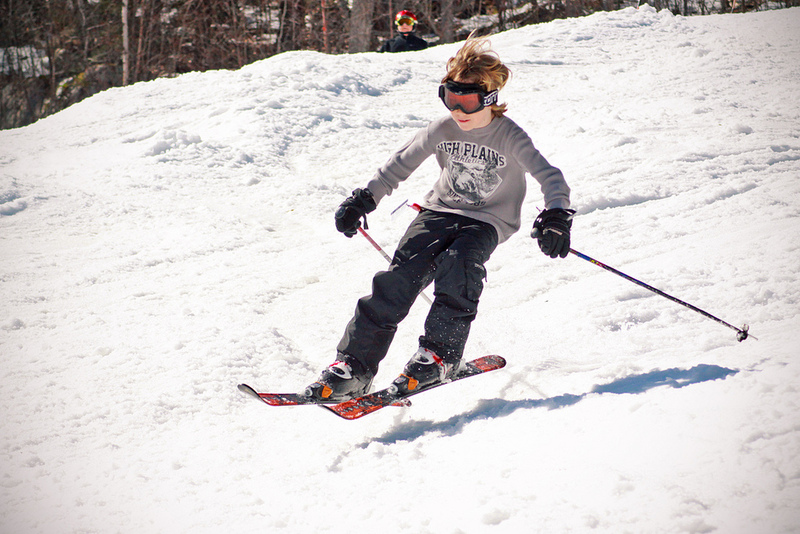 Bretton Woods – New Hampshire’s largest ski area – has partnered up with some of New England’s finest ski and sports shops to offer a free 2013-14 Junior Winter Mountain Pass with the lease or purchase of a junior equipment package. 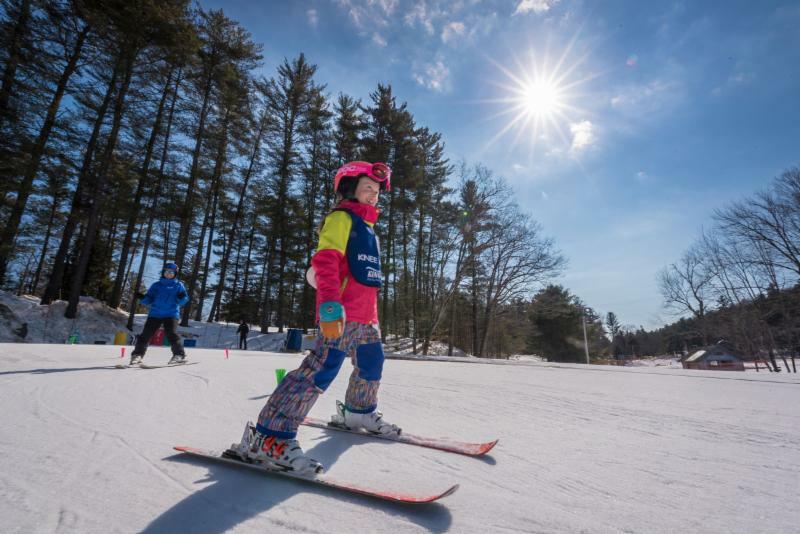 This exciting new program was designed to introduce skiers and riders ages 5-12 and their families to Bretton Woods’ family-friendly terrain and programs, while offering some great added-value to their equipment investment. “Bretton Woods has always been known as a great family mountain, and now our younger guests can experience award-winning terrain for free while skiing and riding on the latest equipment from our partners,” says Chris Ellms, Director of Ski Operations. The Junior Winter Mountain Pass – valued up to $489 – includes unlimited skiing and riding during the 2013-14 season, including night skiing! Plus each Junior passholder can save $15 on one full-day, all-mountain lift ticket per day, which means mom or dad can share in the savings too! To learn all the benefits of the Junior Winter Mountain Pass, please visit brettonwoods.com/seasonpasses or call 800.258.0330. Quantities are limited, pass is non-transferable and other restrictions apply. Contact individual retailers for specifics on their seasonal Junior Equipment Package programs. Summer attraction operations remain in full swing at both Attitash Mountain Resort and Wildcat Mountain, but major improvements and investments for the 2013/2014 winter season are being made at both ski areas as fall approaches. Attitash Mountain Resort will host its 16th annual Oktoberfest on Columbus Day weekend at the base of Bear Peak this fall. Across the road, on the other side of Route 302, a major rejuvenation project costing 1.3 million dollars is taking place at Thorne Pond. “Thorne Pond is a major resource for Attitash especially for our snowmaking water. Ever since Tropical Storm Irene, the available water and in turn our snowmaking systems have been compromised by the excessive silt left by that weather event,” said John Lowell, President of Attitash Mountain Resort and Wildcat Mountain. “A major rejuvenation project is underway in cooperation with the Department of Environmental Services that will restore the original capacity of the pond. More importantly, it will clean up the sediment on the bottom of the pond making the water crystal clear and less detrimental to our snowmaking pumps.” Also during the off season, another quarter million dollars of capital money is being spent on major lift maintenance projects for both the Summit Triple and Top Notch Double lifts. Additionally an entirely new fleet of HEAD rental skis has been purchased that will improve the rental process and skiing experience for customers. Looking ahead to the 2014 summer, Attitash is hoping to expand its year round attractions and is well in to the late planning stages for the construction of two major zip lines. Approval has been granted from the Town of Bartlett and U.S. Forest Service. The Zip Tour experience would offer a 5000 foot zip line from Bear Peak to Attitash. That would currently be the longest single span zip line in the continental US. A second zip line of 3000 feet would return the riders to the base of Attitash. The final decision is expected this fall. Wildcat Mountain completed its planned project and spent over $55,000 to remove the old summit gondola building that had long been abandoned for use and not maintained prior to Peak Resorts acquiring Wildcat. “We’re pleased to have finally completed the removal of the old summit gondola building and to have fulfilled the request made by the U.S. Forest Service when Peak Resorts obtained its land-use permit,” said Brian Heon, General Manager of Wildcat Mountain. “I feel our passholders and all other visitors will appreciate the restored natural beauty at the summit.” Heon added that an additional quarter million dollars is being spent this season upgrading the network of snowmaking pipe on the mountain and upgrading the snowmaking pumps. One of the greater benefits of this investment will be improved snowmaking capacity and efficiencies mountain-wide, especially on the Polecat trail. Another significant project for this season at Wildcat is a new dedicated Ski Patrol building in the base area. Additional on-mountain improvements for the 2013/2014 season include Attitash Mountain Resort continuing to build up and brand its terrain park on Bear Peak. The new “Abenaki” terrain park introduced last season and situated on Lower Myth Maker and Kachina trails remains a priority for Peak Resorts. A central crew of innovative park groomers and cutters and custom fabrication shop will continue to develop and maintain the progressive freestyle terrain area, including the delivery of 8 new rail and box elements. Wildcat Mountain, for a third year in a row, continues to improve and reclaim the approved glade and tree skiing areas. Peak Resorts is committed to the tree skiing at Wildcat Mountain and Attitash Mountain Resort and is improving areas aggressively, responsibly and consistent with U.S. Forest Service guidelines. Mount Washington Valley Ski Touring Associates has been selected for the 2013 Best of Bartlett Award in the Ski Centers & Resorts category by the Bartlett Award Program. Each year, the Bartlett Award Program identifies companies that we believe have achieved exceptional marketing success in their local community and business category. These are local companies that enhance the positive image of small business through service to their customers and our community. These exceptional companies help make the Bartlett area a great place to live, work and play. Various sources of information were gathered and analyzed to choose the winners in each category. The 2013 Bartlett Award Program focuses on quality, not quantity.Winners are determined based on the information gathered both internally by the Bartlett Award Program and data provided by third parties. The Bartlett Award Program is an annual awards program honoring the achievements and accomplishments of local businesses throughout the Bartlett area. Recognition is given to those companies that have shown the ability to use their best practices and implemented programs to generate competitive advantages and long-term value. The Bartlett Award Program was established to recognize the best of local businesses in our community. Our organization works exclusively with local business owners, trade groups, professional associations and other business advertising and marketing groups.Our mission is to recognize the small business community’s contributions to the U.S. economy. This year you can purchase a season pass that is valid any day of the season, or choose the Limited Pass with holiday blackout dates now available for all ages for extra savings. Your “anytime” pass pays for itself after 6-9 visits, and the new “limited” passes pay for themselves in as few as 5-7 visits, compared to buying lift tickets. College 4-NH Pass (valid at Cranmore, Bretton Woods, Waterville & Cannon) – $289 (no blackout dates). These prices and bonuses are only valid through June 30th so please do not delay. I hope you choose to join us next winter for skiing and riding. We are already working hard to prepare the mountain for winter to make your experience here the best it can be. * Restrictions – Free $25 Cranmore Gift Card. Valid only for Adult Anytime, Adult Limited and Senior pass types, excluding College passes and Super Senior (80+) passes. Family Friendly, Skiing in Mt. Washington Valley, Summertime Fun in MWV! I know you’re feeling what I’m feeling. I can’t wait for the chance to enjoy some vacation time and sunny, summer days. Well, the Memorial Day weekend is here and that means we’re ready to get the summer fun started at Wildcat Mountain. The Wildcat Express summit scenic gondola and New Hampshire’s only ZipRider zip-line cable ride will be ready for you 10 a.m. this Saturday and we’ll be open for the long weekend, including the Monday holiday. After that, we plan to be open weekends only until Sunday, June 10 before we begin to open daily starting Saturday, June 16. For all the details on our summer operations, including lift-serviced disc golf, hiking to scenic Thompson Falls, and more, be sure to visit the Wildcat Mountain website. This year’s “Kids Free Fishing Day” event scheduled for Saturday, June 2 will be a great way to learn how to fish or develop your fishing skills. Representatives and volunteers from the U.S. Forest Service and Appalachian Mountain Club will provide a day’s wealth of experience and knowledge to help the beginning angler get started.The free event will take place from 10 a.m. – 3 p.m. rain or shine (*registration cut-off is 12 p.m.) and all ages are welcome. Children must be accompanied by a parent or guardian and all persons should bring proper footwear and clothing as well as personal sun protection (hat, sunglasses, sunscreen for skin) and bug repellent. The fishing pond at Wildcat Mountain is accessible via the “C lot” entrance located approximately a quarter mile past the main entrance on the north-bound side of Rt. 16 heading toward Gorham, New Hampshire. For more info, visit the Wildcat Mountain events page online. 2012/13 Winter Season Pass Deadline June 1! 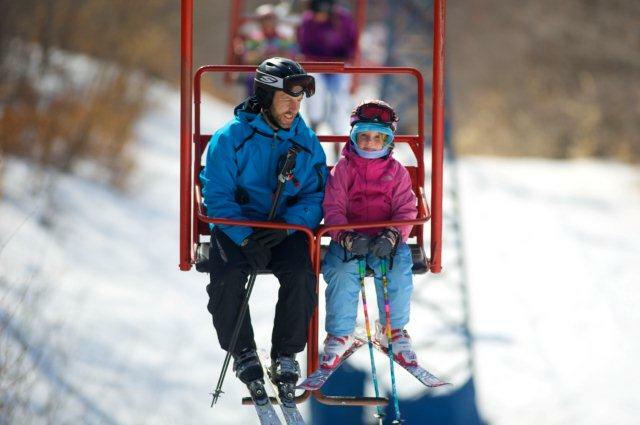 Access a combined total of 122 trails and 505 acres of skiing and riding when you purchase a 2012/2013 Wildcat Mountain & Attitash Mountain Resort Season Pass. We offer nine different season passes, including the new AttiCats Season Pass, valid every day and available for all kids and young adults age 6-18 for just $399 if purchased by Friday, June 1. Rates will increase after Friday, June 1, so don’t miss the lowest pricing available now. See all available passes, pricing, and purchase online today by visiting our Season Pass page. Here’s to having a great weekend with family, friends, and to a moment remembering why we celebrate Memorial Day and honor the men and women who have died while serving in the United States Armed Forces. Skiing in Mt. Washington Valley, Spring in Mt. Washington Valley, Weekend Warriors, Winter Fun! Attitash and Wildcat Still Hanging On!! Wildcat Mountain is scheduled to re-open at 9 a.m. on Thursday, March 29 and will continue to operate through the weekend. Tickets will be $35 for all ages and we project having 15+ groomed trails open. Temperatures this weekend are looking favorable for events at Attitash Mountain Resort. Although Attitash closed on Sunday, March 25, we will still host our scheduled après entertainment on Saturday, March 31. Motor Booty Affair, a 70s disco cover band, will be playing from 1-4 p.m. on the Attitash Snowstage with a Bud Light Beer Promo while the band plays. The Nor’Easter Mountain Coaster will operate 12-4 p.m. and we will host a Pond Skim (hike only/weather and conditions permitting) at 12 p.m. at the Attitash Base Area. Family Friendly, Skiing in Mt. Washington Valley, Spring in Mt. Washington Valley, Weekend Warriors, Winter Fun! Arachnid pro-style, dual slalom race: April 6 and 7!! Pinkham Notch, NH – Inspired by the tale of American alpine ski racer Vladimir “Spider” Sabich and his reign of the former alpine skiing pro tour in the early 1970’s, General Manager Josh Boyd at Wildcat Mountain wants to help revive that spirit of alpine ski racing in the Mount Washington Valley with the Arachnid pro-style, dual slalom race event scheduled for Friday, April 6 and Saturday, April 7. Registration for the Arachnid is $75 ($50 for season passholders) and includes lift access for Friday, April 6 and Saturday, April 7. All racers must be age 18+ and pre-register by Thursday April 5. Time qualifying will begin at 9:30am on Friday, April 6 and is scheduled to take place on the Bobcat trail. Head-to-head bracket competition will begin at 9:30am on Saturday, April 7. For more information and to register, visit skiwildcat.com/ARACHNID-event.html. Wildcat Mountain, a year-round destination located 100% within the White Mountain National Forest in Pinkham Notch, is home to New Hampshire’s most powerful quad summit chair lift and is renowned for its high summit elevation over 4,000 feet and greater than 2,100 vertical feet of skiing and riding; longest novice trail in the state at just under 3 miles; and proximity to Mt. Washington that contributes up to 200 inches of snow and a long winter/spring season annually. Wildcat Mountain has consistently been rated #1 Scenery and Top Ten in the East for Snow, Terrain Challenge, and Value by readers of SKI Magazine. For further information, please visit http://www.skiwildcat.com or call 1-888-SKI WILD. Life in Mt. Washington Valley NH, Skiing in Mt. Washington Valley, Spring in Mt. Washington Valley, Winter Fun! Spring Skiing Is Holding On! The Mount Washington Observatory posted to their Facebook page that a new daily record high of 54°F was set for March 21, 2012, and that the previous record of 43°F was set on March 21st, 1976. Additionally a monthly record high of 54°F was equaled yesterday, March 21st, 2012. The former monthly record was first set on March 31, 1998. According to the Observatory, already, March 22nd’s daily record high of 41°F has been broken, as the temperature recorded at the 2AM EDT observation was 46°F. Temperatures on the rock pile are expected to break into the lower 50s once again today, with the monthly record in sight once again. While it may seem like we skipped spring and went right to summer (sparing us of mud and black fly season! ), Portland’s WCSH meteorologist, Kevin Mannix, warns us that it’s still too early to take the plows off the trucks. According to Kevin, “April is a winter month”. Many of our ski resorts hope Kevin is right, and are still planning to stay open and hold events into April if conditions permit. Believe it or not, there’s still plenty of snow to welcome spring skiers. While most XC Centers and about half the Valley’s ski resorts have now closed there is still skiing available in Mt Washington Valley. Read below for snow reports from Attitash, Bear Notch Ski Touring, Bretton Woods, and Wildcat, still open and welcoming skiers. Attitash: Presently skiing on 114 acres with 24 trails and 4 lifts operating. Base depths of 4” – 24”. Bear Notch Ski Touring Center: 20 km open –20KM classic and 20KM skating on a 2” – 6” base. Black Mountain: Closed on March 18 for the season. Bretton Woods Ski Resort: Presently skiing on 64 acres with 14 trails and 2 lifts operating on a 12” – 30” base. Bretton Woods Nordic Center: The Bretton Woods Nordic Center closed for the 2011-2012 season at 4:00PM on Tuesday March 13. Cranmore Mountain Resort: Closed for the season, however Cranarchy is still scheduled to take place on Sunday, March 25th, as a hike up and an informal rail jam. Great Glen Trails: The trail system, SnowCoach, and tubing are closed for the season. King Pine Ski Area: The 50th ski season at King Pine has officially come to a close on March 20, 2012. Purity Spring XC & Snowshoe Reserve: Purity Spring XC and Snowshoe Reserve is now closed for the season. Jackson Ski Touring Foundation: Closed for the season on March 18, 2012. Shawnee Peak: Presently closed, but re-opening this weekend for the annual end-of-the-season Slush Cup. Wildcat Mountain: Skiing on 16 trails accessed by 1 lift on a 6” – 24” base. NORTH CONWAY, NH – Cranmore Mountain in North Conway, NH will hold a “Going Away Party” on Sunday, March 18th to mark the retirement of its East Double Chairlift. The East Chair is being replaced with a triple chairlift to be installed in time for the winter 2012-13 operating season. The East Double Chairlift was installed in 1955 and is the oldest operating double chairlift in New England. The East Slope has been a highlight of the Cranmore ski experience for almost 60 years. The East Chair, known for its bright red chairs, is a favorite among Cranmore skiers and ski history aficionados alike. The public is invited to ride the East one last time on March 18th, starting at 8:30am (lift ticket or season pass required). Skiers are welcome to reminisce about their favorite days on the East, take a few runs, than meet at the Meister Hut at 9am. Ski historian Tom Eastman will present a short presentation on the history of the East Chair. GM Ben Wilcox will then talk about the new triple chair being installed in its place. The going away party will also give East Chair fans a chance to sign up for a waiting list to purchase one of the 60 chairs from the lift later this summer. The new fixed-grip triple chairlift was purchased from Wachusett Mountain in Massachusetts. It will have an increased vertical in a new location on the south side of the mountain, adding 300 vertical feet compared to the East Double. The lift will be slightly longer than the East Double but has the same number of chairs. The new lift will have 11 towers where the existing has 9 towers. The top of the lift will remain in approximately the same location. The lift base would be moved to the Tommy’s Trail area which would add trails including Gibson, Gibson Chutes, Artist Falls, Koessler and Upper Beginner’s Luck to the current East Chair trail access (East Bowl, Easy Street, Gibson Pitch and Schneider). The East Slope experience would go from 3 to 9 trails and the ski vertical from 526’ to 826’. It will increase the uphill capacity for that lift by 50%. The upgrade of the lift is part of a $1.3 million investment being made at Cranmore this summer, on top of the $7 million in improvements that Cranmore has seen in the last 18 months under new ownership announced in June 2010. In addition to the new triple lift, Cranmore will be installing a new 700 foot zip line for its summer Mountain Adventure Park operation reopening for the season Memorial Day weekend. For more information, please visit cranmore.com or call 1-800-SUN-N-SKI.